We invite you to come, stay and enjoy the beach paradise at Punta Duarte Gardens Bed & Breakfast at Panamas Gold Coast. Panama’s Gold Coast is located south of Santiago, Veraguas, and ends at the southern tip Azueros with the National Park Cerro Hoya. Fantastic sandy beaches alternate with rugged lava beaches and tropical forests. Widely traveled will be reminded of Manuel Antonio in Costa Rica or Hawaii. The area was long forgotten and developed only in recent years. Punta Duarte is in the middle of the Gold Coast. From here stretches the coastal area about 25 km in either direction. The Gold Coast is currently a hot spot for fishermen and people looking for a property. Punta Duarte Gardens offers 5, bright and spacious rooms. If you like secluded beaches and calm, you are right with us. Nightclubs and bars, we can not provide the broad context. By the way, all images on this site, except that the trips are of our land. Enjoy Wonderful beaches, with secluded coves, turquoise waters, offshore islands and palm trees. . 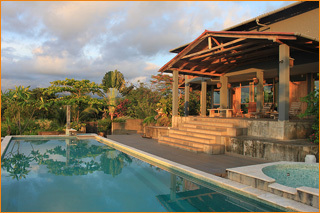 The finca has around 170 hectares, with beaches, forests and grasslands. From the entrance on the main road to our house over the beach it is an other 4 km. Please note that our entrance is locked, and therefore a previous call is absolutely necessary.